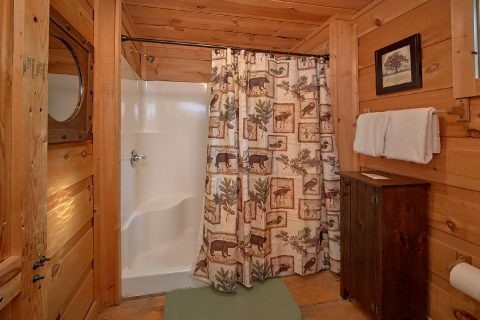 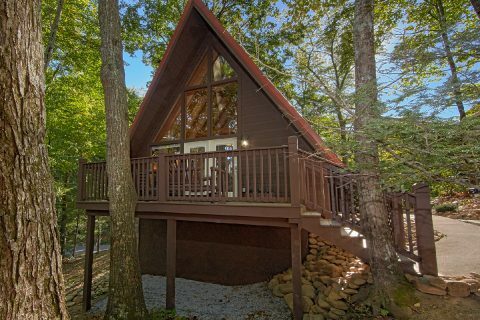 When you book this cabin that's minutes away from Ober Gatlinburg, you'll be so close that you're "Skiing With The Bears!" 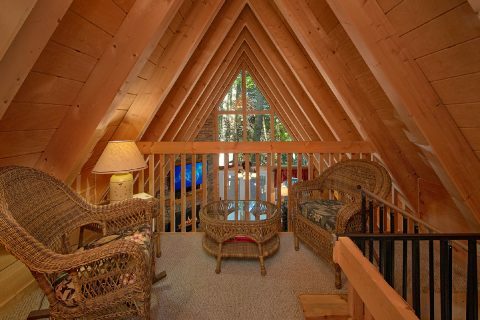 This cozy, A-Frame style cabin rental rests in a beautiful location in the Chalet Village Resort area. 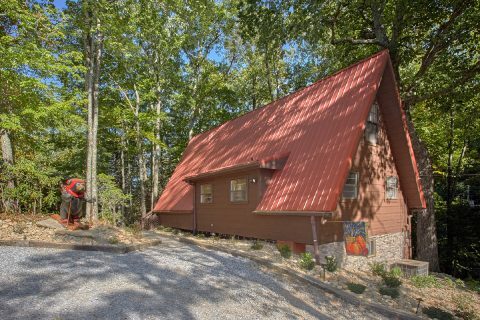 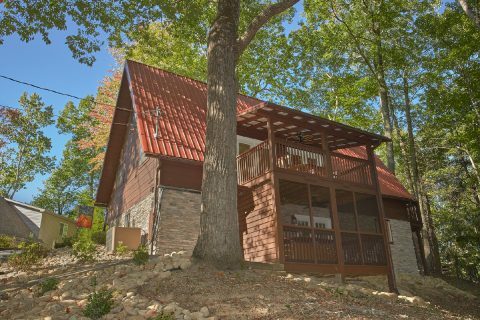 Not only does this rental keep you close to the slopes of Ober Ski Mountain, but it also places guests only 2.6 miles from Downtown Gatlinburg. 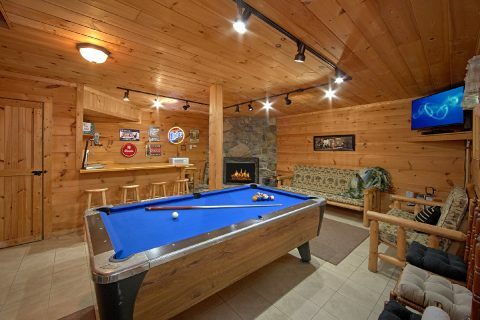 This cabin also offers guests outdoor pool access through the Chalet Village resort area! 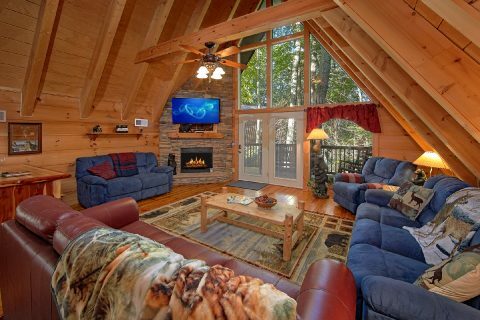 Since this cabin offers quick access to tons of attractions like the national park and Ripley's Aquarium of the Smokies, you'll have no shortage of things to do during your stay! 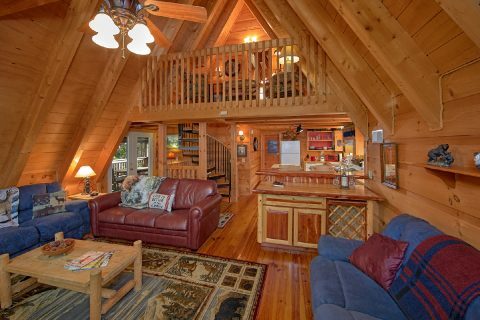 As a result, this cabin is ideal for ski trips in the winter and summer hiking vacations. 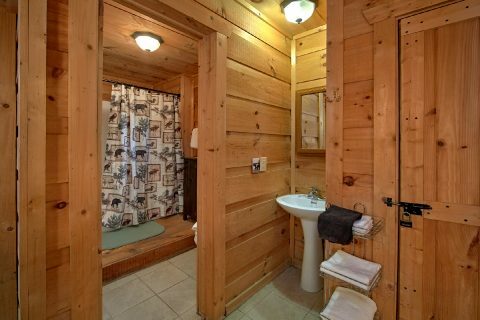 Better yet, you can look forward to returning to a comfortable cabin at the end of a long day. 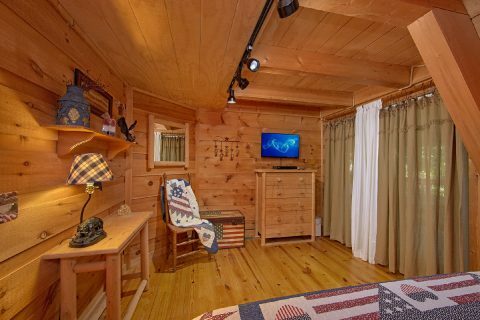 This 3-bedroom cabin sleeps up to 8 guests in comfort with several private bedrooms and a sleeper sofa in the main living room. 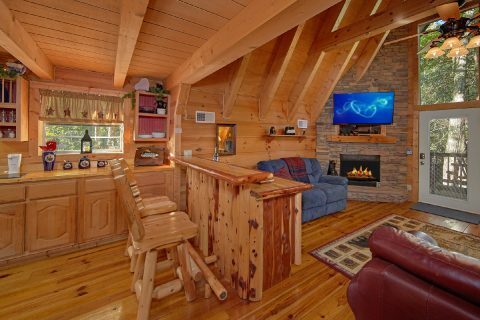 Step inside the main living area of your cabin to relax in the seating area near a gas fireplace and a 55-inch HDTV above the mantel. 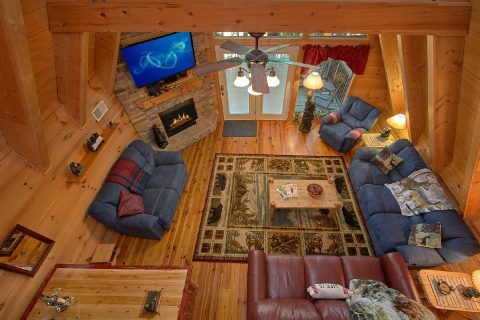 This room features large, picture windows to enjoy your cabin's forested setting. 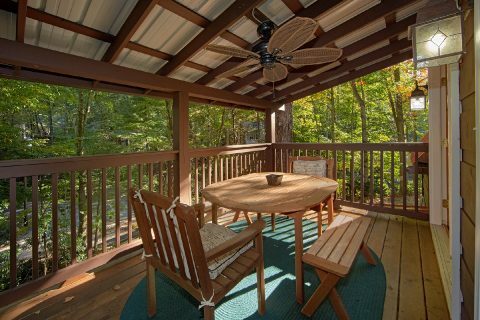 From here, you can step out to a deck where you can enjoy the mountain breeze. 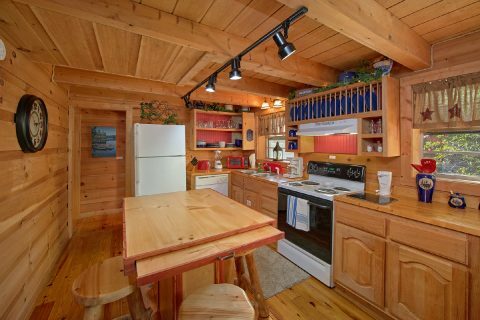 Nearby in the full kitchen and dining area, you and your family can enjoy great meals at the kitchen table with 6 chairs and a kitchen bar with two stools. 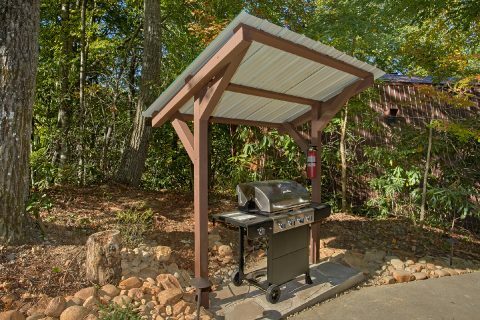 There's also a gas grill for grilling up delicious food at your cabin. 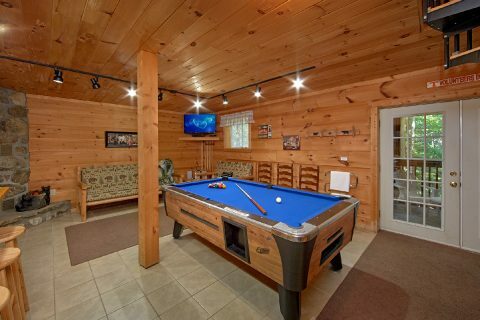 After dinner, go down the spiral staircase to the game room to play a game of billiards in the game room equipped with a 42-inch HDTV and a gas fireplace. 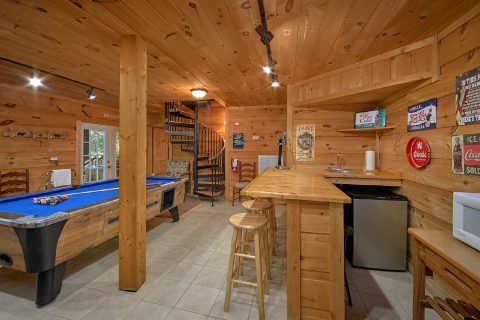 You'll also have a blast playing games on the 60 game arcade game! 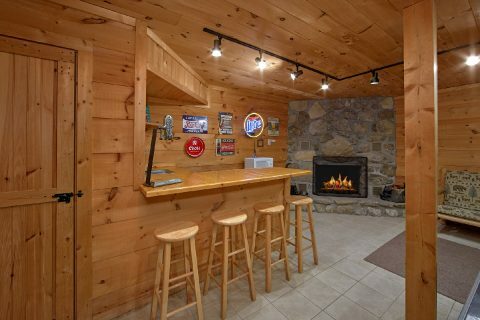 This room also features a wet bar, mini-fridge, and microwave for enjoying snacks and refreshing beverages during your stay. 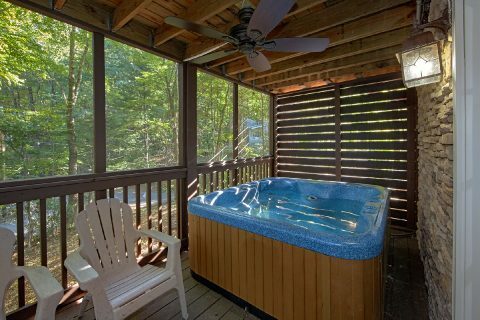 Afterward, step outside onto the lower, screened-in, covered deck to take a soothing dip in the hot tub without being pestered by insects. 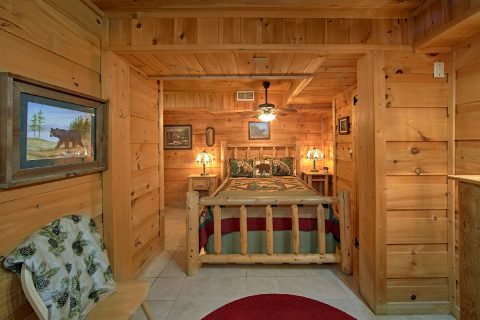 Once it's time to get some rest, you can get some shut-eye in one of your cabin's private bedrooms. 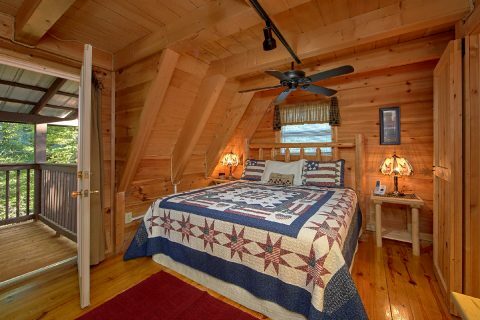 The main level is home to a bedroom with a king bed, a 32-inch HDTV, and it also boasts access to a back deck complete with rocking chairs and a porch swing. 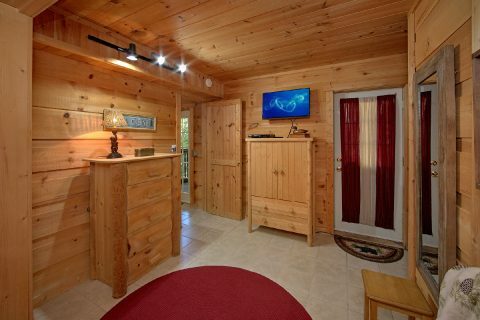 The lower level bedroom comes with a queen bed, 32" HDTV, and a full bathroom. 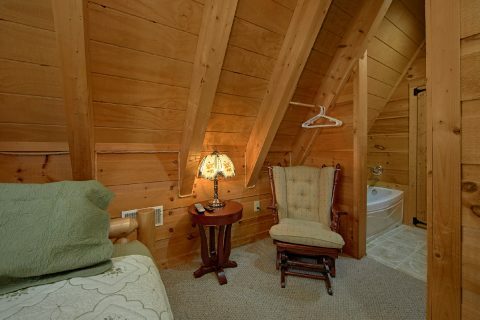 Lastly, you can ascend the stairs to the upper level with a private bedroom complete with a 32" HDTV, a jacuzzi tub, and a bathroom with a shower. 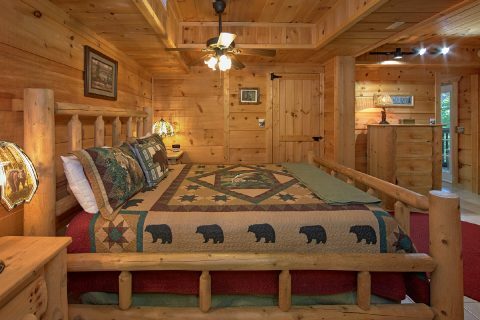 This room offers a day bed that can turn into a queen bed for added sleeping space. 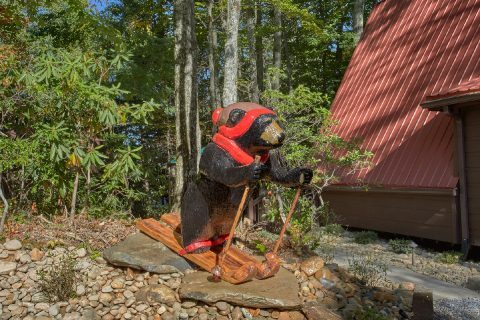 Start planning a terrific Smoky Mountain vacation today by booking "Skiing With The Bears!" 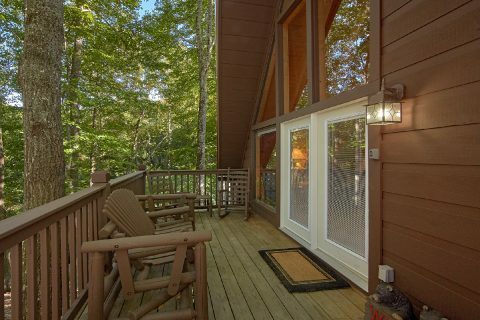 Simply check this cabin's availability online or call our helpful reservations office to see how much you can save on your getaway to the Smokies!